1 of 3 Heat oven to 425 degrees. In a small bowl, combine lemon zest, rosemary, thyme, 1/4 tsp of the salt and 1/8 tsp of the pepper. Tuck under skin of chicken and spread pieces on a baking sheet. Roast at 425 degrees for 30 minutes. 2 of 3 Meanwhile, heat oil in a medium lidded saucepan over medium heat. Add carrot, celery and shallots and cook 5 minutes. Add broth, increase heat to high and bring to a boil. Stir in barley and 1/4 tsp of the salt. Cover, reduce heat to medium-low and simmer 12 to 14 minutes. Let stand 5 minutes; drain if needed. 3 of 3 Assemble salad and make dressing: Combine cucumber and beets in a bowl. Whisk yogurt, lemon juice, sugar and remaining pinch of salt and pepper in a medium bowl. 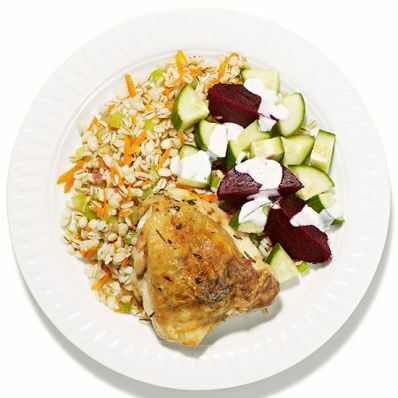 Serve chicken with barley pilaf and beet salad. Drizzle salad with dressing just before serving. Per Serving: 7 g fiber, 49 g pro., 515 mg sodium, 493 kcal cal., 14 g Fat, total, 193 mg chol., 5 g sat. fat, 41 g carb.